Our team of experienced installers can take care of it for you, giving you that finished, professional look every time. Or, just follow the installation instructions we've provided here - we put together a few tips and tricks that have helped us out over the years to make the job a bit easier on you. Basic steps on installation from Exotic. Please Read this document completely from start to finish before installation as all the info. is important. 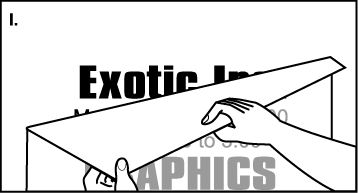 Exotic assumes no responsibility for damages caused by the use of these instructions. 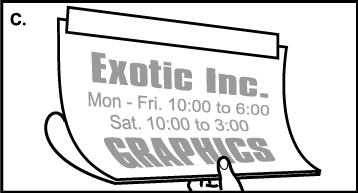 Exotic uses only the best vinyls. When properly installed, these films are permanent. Removal of the decals can be accomplished without damaging the surface. You must forcefully remove these permanent films. See Removal Instructions for more info. 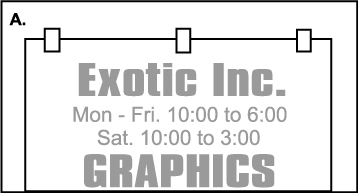 The Products: Exotic produces two types of custom decals and graphics: Cad Cut and/or Printed Cad Cut. Cad Cuts are delivered to the customer as a 3-layer product. The top masking (much like masking tape) keeps intricate vinyl shapes and letters pre-spaced for ease of installation. The backing paper protects the adhesive side until ready to install. And of course the center is the vinyl. The vinyl is a pressure sensitive material with an adhesive backing. The vinyls used for Cad Cuts are sheets of solid color. When you order multi-color decals, they are produced by layering the vinyls on top of one another. They will still act as one center piece to install. All decals from Exotic are ready to install. No extra assembly required. Printed Cad Cuts are delivered to the customer as a 2-layer product. The top is the vinyl and the bottom is the backing paper which protects the adhesive side until ready for install. The top printed vinyl is protected by a gloss laminate. This is to protect the ink from damage in the elements and when cleaned. * Heat gun not included. Work Area: Must be dust-free. Prevent scratching the surface during installation, avoid wearing clothes with buttons, exposed belt buckles or zippers. The air and application surface temperatures should be above 60 degrees F.
Surface Preparation: Remove everything possible that is in the area where you're going to apply the decals (nuts, bolts, fittings, whatever you can). It will make the job much easier. If removal of decals is necessary, see Removal Instructions. Wash your hands. All surfaces must be considered dirty and should be cleaned prior to the application of decals. Remove all adhesive residue, waxes, dirt, oil, bugs, etc. 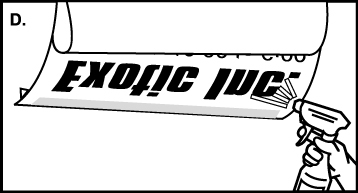 Exotic suggests Rapid Remover. Then clean with Rapid Prep. If area is basically clean, just use Rapid Prep. Alternate Method: Saturate a clean cloth (lint-free if possible) with a mixture of two parts water to one part Isopropyl Alcohol and wipe the surface. (Windex window cleaner may also be used.) Wipe the surface dry with a clean, dry, lint-free cloth. Reinspect surface to assure that it's free of adhesive residue, waxes, dirt, oil, bugs, etc. as all of these will show through the decal if not removed. For Clear Coating: A commercial wax and grease remover should be used first. Scuff surface with fine scotch brite pad (white or gray), or 800 grit wet-or-dry. Scuff in one direction. Known clears that work: PPG and Sikkens. You should consult the painter for your final decisions. Determine Locations: Decals are designed to fit into or onto a desired area. Depending of the design of the decal, some are fitted and go right into place without any trimming, while others are designed with some parts going off the edges or over spaces (gaps) in the surface. This is done so that some final trimming and tucking will give you the best results. Using masking tape, place all of your decals in their desired position first. To make this task easier sometime it is best to trim off the excess area around the actual decal. Trim to about one eighth inch from the edge of the decal. Once you have all of your decals positioned properly, there are several methods of installation. NOTE: Pick a spot to measure from that you can use on both sides if applicable. This will keep your boat looking symmetrical. Installation: Here's where different methods are used. Peel and Stick: This is not the preferred way to produce the desired final product, as it is hard to position things and you only get one attempt. Peel and Stick Wet Application: This method allows you to reposition the decal if you're not satisfied with the positioning. However, with Cad Cut decals, after a few times on and off the vinyl will start to release from the premask and you will lose your positioning and have a big mess. If this starts to happen, stick it on ASAP! Registered Peel and Stick: Not suggested for the inexperienced installer but sometimes necessary to use if you need to put decals on and don't have ample time to wait to put your boat in the water, this is a method you can use. Registered Wet Application: is the suggested method of installation. This allows you to get everything where you want before you begin the installation. This is the easiest way to apply the decals. NOTE: When ever applying decals wet, it's suggested to leave your boat in the sun as much as possible. (Place the decals facing the sun even if you have to prop up the side of the craft. 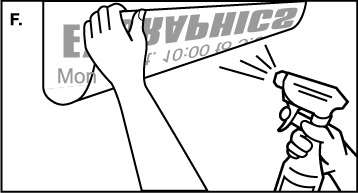 Rotate your boat with the sun and switch sides every few hours) The slow baking of the decal is what causes the adhesive to bond. It's best to wait 24-72 hrs. before using your craft. A. 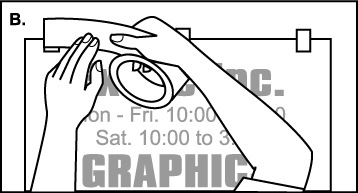 Use 1” or 2” (2.5-5cm) strips of masking tape to position vinyl decal in proper registry (position). *You can place tape where ever you need to for positioning. B. Apply horizontal tape hinge at the top of the vinyl decal. Working the tape horizontally and applying the decal from top to bottom is the simplest. You can achieve the same desired results no matter which direction you work from. C. Peel the liner half-way and bend it back to meet the edge of the pre-mask. Keep exposed adhesive off surface. D. Spray adhesive with Rapid Tac. NOTE: It’s best to start with the decals at the bottom. This lessens the chance of getting your other decals wet. Wetting can destroy the backing paper and make a mess of your decals and possibly ruin the decal. E. Allow vinyl decal to drape. Always use firm squeegee pressure. Begin at top center. Pull down as far as half the squeegee’s width. 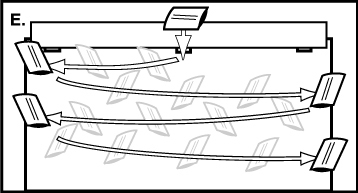 Then work from side-to-side using a sweeping motion while slightly overlapping each time. While applying side-to-side be sure to keep the squeegee angled outward. This pushes the air out from under the Vinyl. If you stop squeegeeing, start back where the vinyl is already applied and continue the side-to-side motions. NOTE: If you angle the squeegee inward you will create major air bubbles. F. Remove liner entirely. Keep exposed adhesive off substrate. Spray Rapid Tac on substrate and adhesive area. G. Allow vinyl decal to drape. Using firm initial squeegee pressure, continue at top center and work down and outward to each edge of mask. Reference section E.
H. Allow adhesive to bond about 15 to 30 minutes. I. Remove premask at 180 degrees (pull back on itself). Spray mask with Rapid Tac. J. Re-squeegee entire Vinyl Decal. STEP 1. Heat decal with a heat lamp, or heat gun (a hair dryer will work, however, it will take longer and can burn up the hair dryer). STEP 2. 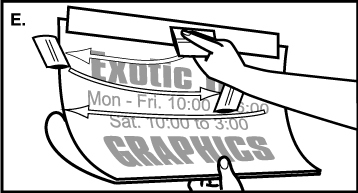 While decal is hot, use a Exotic Chizler to start pealing back the graphics. Starting at a corner usually works best. The Exotic Chizler saves a lot of time, your fingers and your fingernails. We strongly suggest using one of these. After getting it started, use both hands as you get to the wider sections of the decal. Go SLOWLY. Too much tension will cause the decal to tear. NOTE: The heated area will cool off after a few minutes, causing the adhesive bond to increase again. You will notice that the tension will increase and the decal will tend to tear easily. So make sure to continually heat the areas as you work on them. STEP 3. Spray glue residue with Rapid Remover and let penetrate for 30-60 seconds. This is the only product we recommend for removal of glue. When removing signs, stripes, graphics and decals Rapid Remover is a guaranteed 60 percent labor-saving product. WARNING: Using lacquer thinner, MEK, acetone, Goof off, paint stripper or other similar products can be used as an alternative, but can be harmful to the surface and to you. STEP 4. Using a Squeegee or a Exotic Chizler, scrape to remove glue residue. STEP 5. Spray Rapid Remover on a paper towel and wipe surface clean. If surface is not clean repeat steps one through five. STEP 6. Wipe surface with Rapid Prep Application fluid or water. Product is water-soluble. NOTE: Older decals tend to become brittle over time and keeping them warm is very important. Some decals simply don't cooperate and take longer to remove or break into little pieces. WARNING: Rapid Remover can only be shipped by ground or sea. Product becomes a combustible hazard when shipped by air. The Heat Gun Trick: (Hair dryer if you don't have a heat gun) This works unbelievably well with cad cut vinyls. This trick is used for two reasons removing wrinkles/creases and conforming the Vinyl to the shapes of what you're installing onto. To use the trick, it is best to remove the premask when possible. 1. Removing wrinkles/creases: Peel back the vinyl. You can just work the effected area. Make sure that none of the vinyl gets stuck to itself. With the heat gun, slowly go over the vinyl and it will slowly return to its original shape. Let stand for a minute or two before you attempt to reinstall the vinyl. You do not have to remove the entire decal if you only have a wrinkle in the edge. Trimming overlaps or excess: After the application to the desired area is complete, tuck excess into corners or gaps in surface. If it overhangs a flat area pull taut and trim using the edge of the surface as your trim guide. Care and Maintenance: Wash with soap and water. Use degreaser or heavier cleaner only where needed. Then we recommend Rapid Clear (a vinyl and plastic polish). Alternative: automotive wax. Be extra careful when cleaning and waxing. Don't wipe cloth into a sharp corner. Radius or trim the corner with a razor blade. Very Light pressure is required to cut this product if your blade is new. Apply a small "dot" of clear nail polish over corner making certain to contact both vinyl and surface. If step one fails, trim off the loose vinyl. Trim off loose vinyl or laminate. Use clear stripe to re-seal edge. Apply the stripe half on the surface and half on the vinyl. (Suggested). Seal-it Pen to seal the exposed edge. Air Bubbles Tape installed over too large an area in one sweep or tape accidentally contacted. Tape should only contact when squeegee contacts it. Wrinkles Not enough tension Increase tension or Use heat with tension. Wide sections starts to bunch up (Outer edges try to converge into the middle) Incorrect installation motion; correct motionalso acts to keep the vinyl spread apart. Use practice stripes to perfect technique. Increase tension or use heat with tension. If you have problems, stop immediately (if you continue past the problem area too far, you will probably never recover). Slowly peel back contacted tape prior to the problem area. Apply some heat and try again. In all cases, you should be able to pull the tape back up several times and try again. After that, the clear top carrier will start to separate from the vinyl. Welcome to the wonderful world of graphics installation!